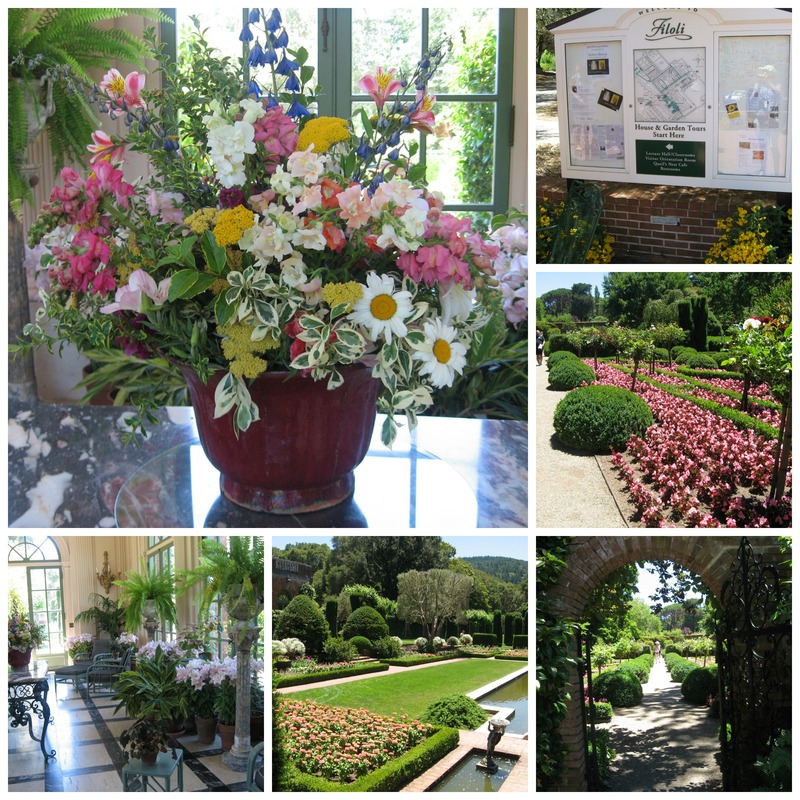 On my recent trip to California with the Garden Blogger’s Fling, we visited Filoli, an estate garden that wowed us with all of its formal gardens and big expanses. 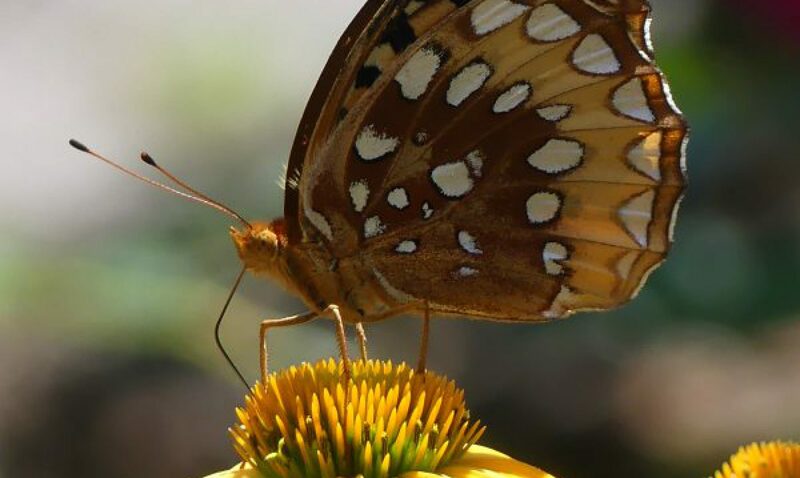 Composed of 16 acres of formal gardens in a 654 acre estate, Filoli is a California State Historic Landmark Site. I loved wandering the gardens that hot, hot day(over 100!) and looked for every bit of shade that I could find. But when I saw this miniature knot garden standing next to the larger knot gardens, it stopped me in my tracks and I took my time to look at it and marvel. I have always loved the precision and beauty, and the geometry of knot gardens. And I love miniatures, so this little garden was a combination of my passions! 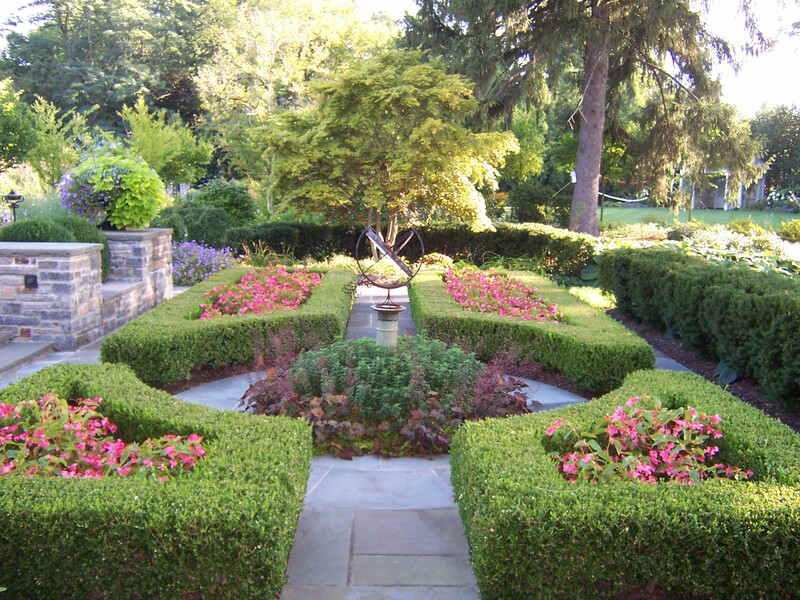 I have designed a total of one knot garden in my landscape design career and would love to do another. 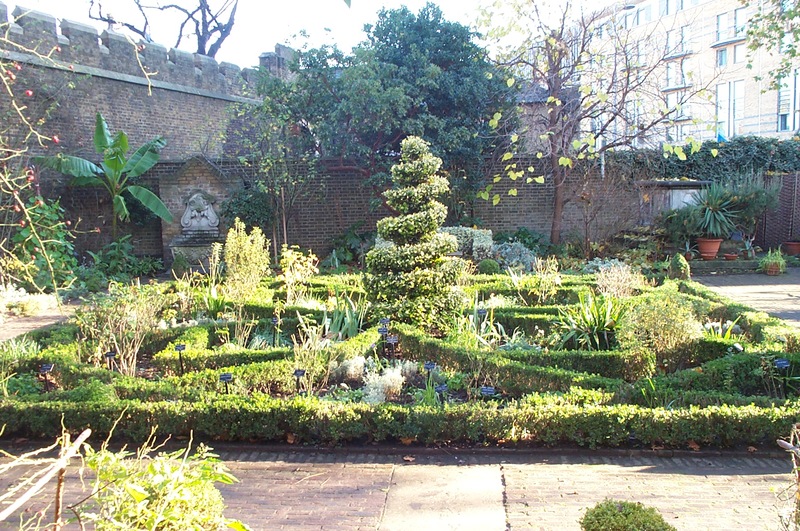 The primary hurdle to knot gardens is the high degree of maintenance, which entails constant shaping and trimming, and that doesn’t fit into modern lifestyles anymore. All that clipping, fussing, and weeding is not most people’s idea of fun. But a miniature one; Much more doable! I was instantly smitten and ready to try one at home for myself. So, what plants did they use at Filoli for the minis? : Myrtus communis ssp tarentina ‘Compacta’ or Dwarf Myrtle, Teucrium chamadrys or Germander, Leptospermum scoparium , and Buxus microphylla var. japonica or Morris Midget Boxwood. The gift shop sold small plants of three of these varieties if you wanted to start your own little knot garden. For the larger knots, the plants used were Lavender, Wooly Horehound, Germander, Crimson Pygmy Barberry, Tuscan Blue Rosemary, Grey Santolina, and Dwarf Myrtle. Knot Gardens were thought to originate from ancient Arabian gardens, but are more commonly associated with European gardens of the Middle Ages and Elizabethan England, where the nobility enjoyed the colors and patterns from their castle windows. The main purpose was to display royal coats of arms. Also popular were designs of plants or animals, or stitches of embroidery. An open knot, like at Filoli, would be filled with colored gravel and soil, and a closed knot, would be filled with flowers. What makes Filoli’s knots unusual is the three-dimensional look of over and under-lapping strands that are shaped very carefully to give an intricate and wave-like appearance. 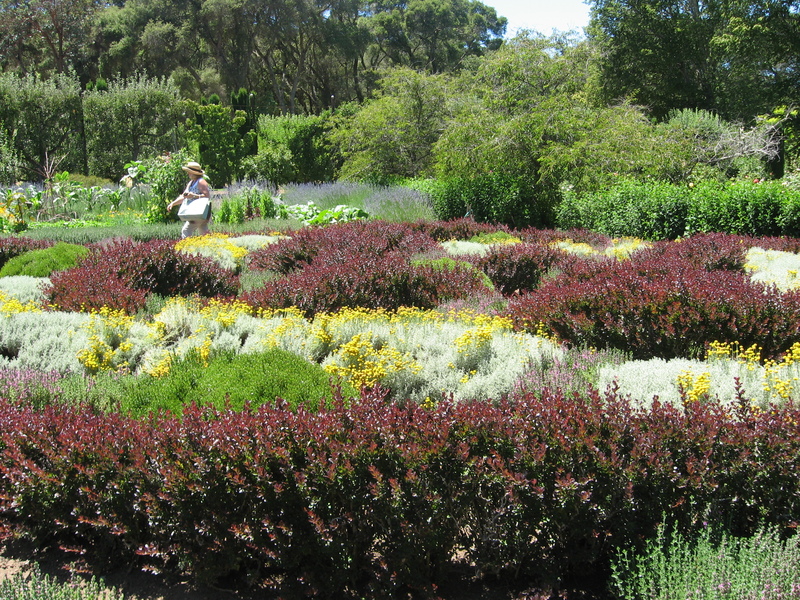 Filoli’s large knot gardens were designed and donated by the Woodside-Atherton Garden Club in 1976. Each knot is 36 feet square, and plants were placed on one-foot centers using string lines to get everything precisely square. The knot gardens are located in the panel gardens, and are bordered to the north and south by hedges of Hibiscus syriacus and Copper Beech, Fagus sylvatica. 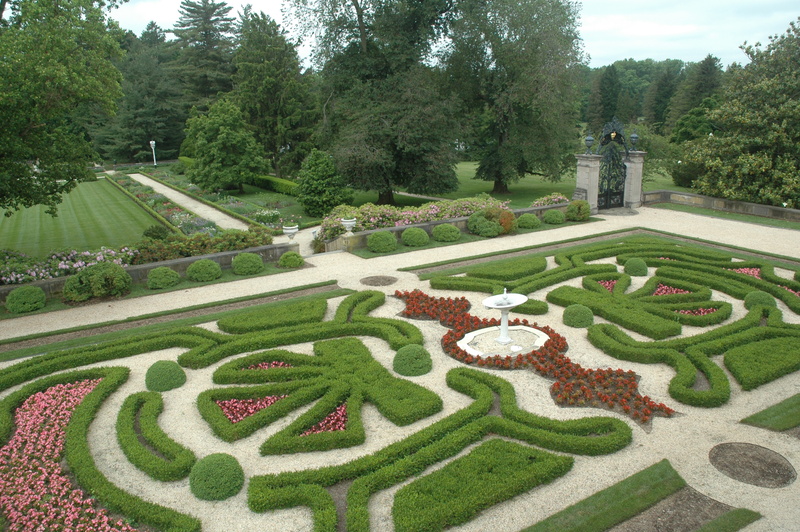 The plant material in the knot garden was chosen for attributes of contrasting colors, fineness of the foliage, and their similar rates of growth. The miniatures were the idea of Mrs Duncan Low, also a member of the garden club, in 1991. Workers made two 36″ square boxes of wood that were engraved on the sides with brick lines to resemble the brick walls of the garden. 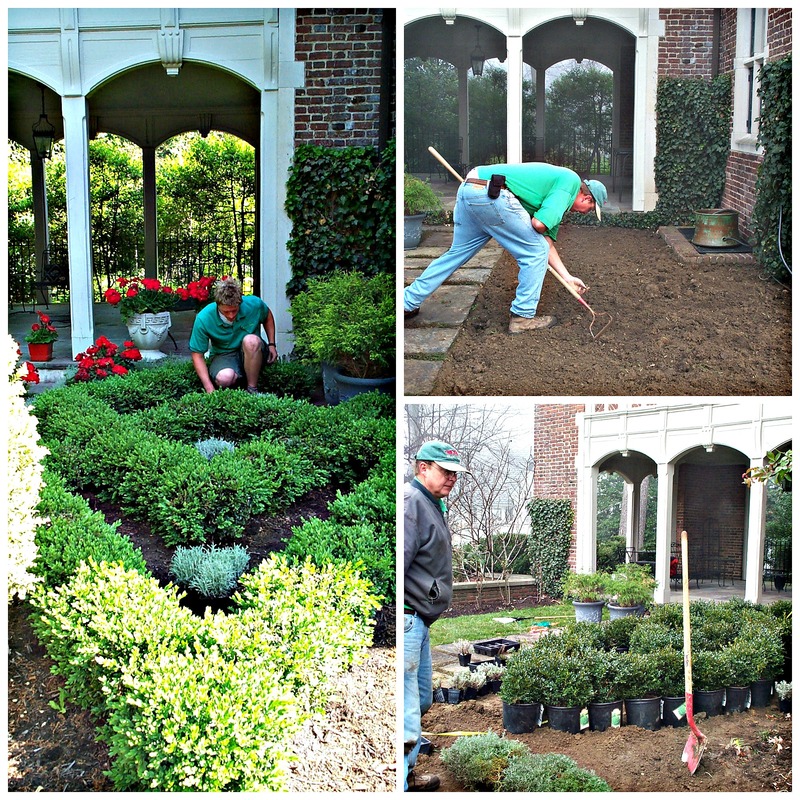 The tiny plants were planted one inch on center and are weekly pruned with bonsai sheers. 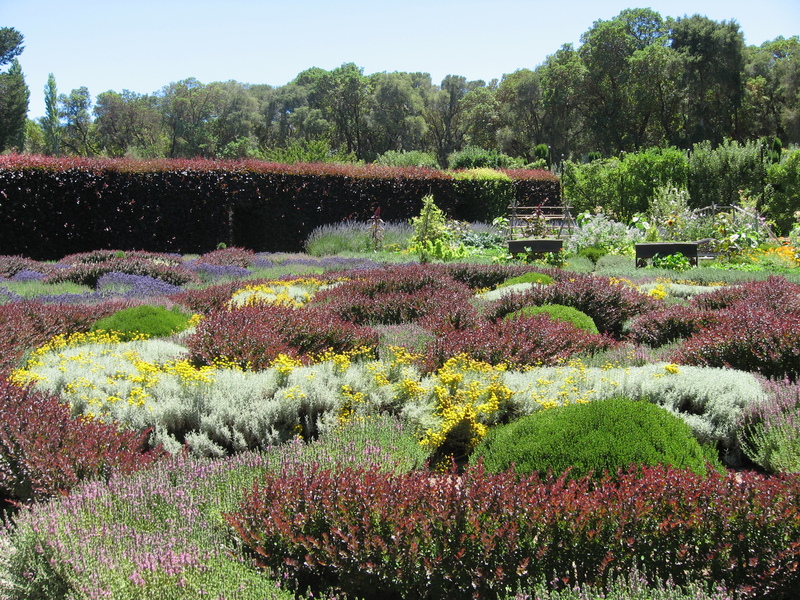 The larger knots are renovated every five years, with the lavender and santolina being totally replaced as these plants don’t perform well under intense pruning and sheering. They are watered by irrigation once a week in the warmer months and fertilized annually in late fall because of the extreme root competition. The knots are also hedged hard in late summer after blooming, and an application of redwood sawdust is applied annually. Creating a miniature knot garden is maybe a future winter project for me. 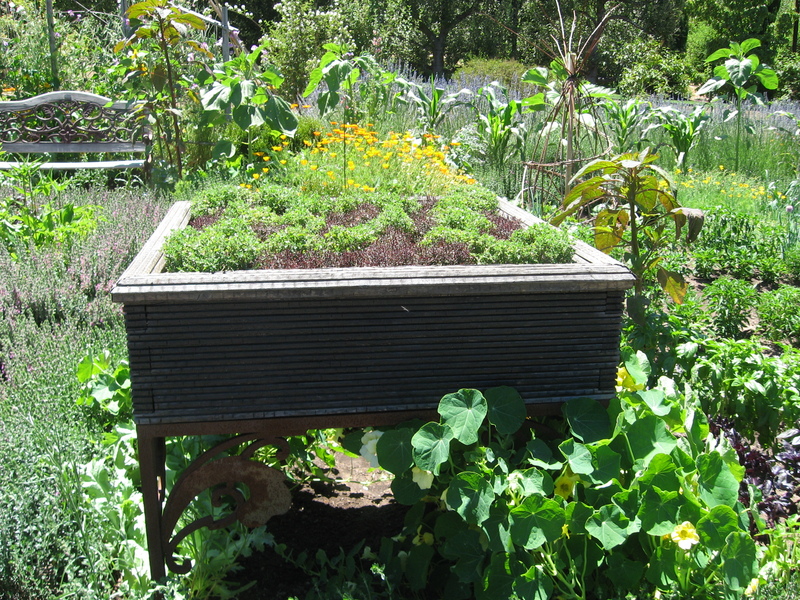 I have located a source of plants, and I just need to create that wooden box! They are stunning and I love them all. Love this blog. 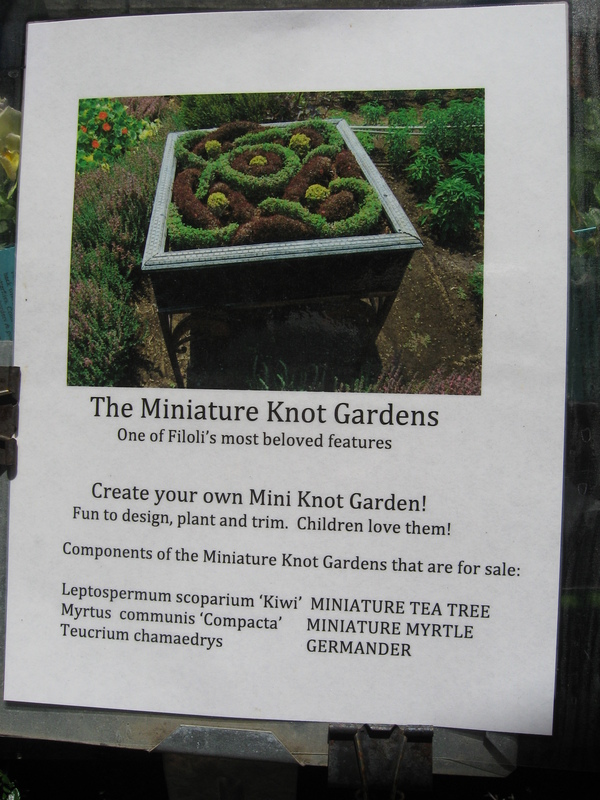 I did not know what a knot garden was……….now I do! Previous PostPrevious Black Crepe Myrtles?